If you need yet another example of just how far the Reds organization has come in drafting and developing talent, look no further than Dan Langfield. Like Tony Cingrani, many projected Langfield to be a reliever at the professional level, but the Reds drafted both with the idea that each could end up in the rotation. This philosophy stands in stark contrast to the bad old Jim Bowden days, when the Reds burned the 14th overall pick of the 2003 draft on Ryan Wagner, a college closer, with the intention of advancing him quickly up the ladder and into the MLB bullpen. Obviously, the current front office has the advantage in both philosophy (i.e. understanding the value of SP over RP) and execution (i.e. identifying specific players). Cingrani and Langfield are looking like legitimate MLB starting pitcher prospects, while Wagner flamed out before even becoming a competent MLB reliever. The Reds selected Langfield with the 109th overall pick in the 3rd round of the 2012 MLB draft out of the University of Memphis. At Memphis, Langfield worked primarily as a starter and blossomed as a junior, posting a 2.71 ERA, 1.25 WHIP, 4.5 BB/9, and 10.8 K/9 in 93.2 innings in 15 starts. He also has athletic bloodlines, as his dad was drafted in the 10th round by the Blue Jays in 1980. 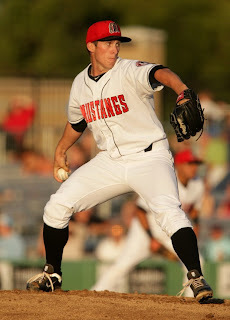 In 2012, Langfield got his first taste of pro-ball with the Billings Mustangs of the rookie-level Pioneer League. For the Mustangs, Langfield posted a 2.68 ERA, 1.19 WHIP, with a 54/17 K/BB ratio over 37.0 innings and 15 games, including 5 starts. A robust start to his career, even if he did have an age vs. level advantage. "Dan has done a great job for us this season," Billings Manager Pat Kelly said. "We used him in a tandem role and limited his innings because of how much he threw in college. Dan has four quality pitches and can be overpowering. He flourished in the month of August." "I'm really excited," Langfield said. "I've been working hard this season to fix some things. Coach Tony (Fossas) has been helping out a lot, and when (Mark) Riggins came down he gave me a few pointers to work on. Everything is starting to feel a lot better mechanics-wise, and while I'm out on the mound - just being a lot more comfortable. It seems like it's falling into place right now, I just still have to keep working to get better." Langfield stands with his hands in front of his chest and begins his windup with a small rocker step towards first base, which allows him to rotate his right foot down onto the rubber. He then brings his front leg up into a leg kick, getting good height, up past parallel, and incorporating some body coil. Up to the apex of the leg kick, he has maintained good balance and body control, generating acceptable force with his lower half. At apex, he gathers himself to drive towards the plate. He unpacks his leg kick and drives strongly to the plate. His stride length is acceptable, long enough to allow his hips to clear, though not as aggressive as it might be. While the stride allows for enough time and space to effectively clear the hips, Langfield's hip rotation isn't overly strong. In fact, like Robert Stephenson, the release of Langfield's right hip coming off the rotation seems slightly delayed and, consequently, in comparison, the shoulder rotation seems a tick early. That, coupled with his three-quarter arm slot, gives his delivery a slight rotational look, as the upper body appears to work around the body. Further, this shoulder rotation pulls his upper body slightly to the first base side when releasing the pitch, resulting in a follow-through that frequently falls off to the first base side. This position can lead to inconsistent command and a reduced ability to field the position. 1. Glove side remains firm out front. As can be seen in the video, Langfield has some recoil to his deceleration phase, as his arm frequently bounces back up after releasing the pitch, rather than finishing down by his front hip. However, the Reds have reportedly eliminated or reduced the recoil, which has led to some immediate performance benefits and should reduce stress on the arm. A proper deceleration is necessary to ensure that (1) a pitch is properly finished and (2) the momentum of the arm is effectively dissipated. Overall, Langfield has solid mechanics, though the shoulder-rotation action and arm recoil have contributed to control problems. It'll be interesting to see what type of refinements he's made to his mechanics when he gets underway in 2013. There is/was some effort to his delivery and some recoil in his follow-through, but he may have polished up those components. However, he doesn't utilize his body as much as ideal and has to generate the force with his arm a bit more than is desirable, but those are more about efficiency and injury risk than performance level. If Langfield can refine his mechanics, then his command may improve and his chances of sticking in the rotation increase. Langfield features a four-pitch mix. He works with a 93-97 mph fastball, a hard biting slider, a changeup, and curveball. The fastball and the slider, though inconsistent, are plus offerings at times and are the primary weapons in his arsenal. The changeup and curveball both have potential and could become solid offerings, especially since he has the ability to throw them for strikes. His slider has better bite, but he more effectively commands the curveball. Ultimately, most pitchers choose one type of breaking ball, either the slider or curve, not both. Effectively utilizing both is difficult because of their similarities. The difference between throwing a slider and curve is more a matter of degree than a completely different technique, so attempting to throw both can water down the effectiveness of each. Most power pitchers rely on a fastball and slider combination, which plays in both the rotation and the bullpen. Obviously, the former will be the primary development path for Langfield, while the latter will be the fallback option. Langfield was a good value in the 3rd round of the draft. Not only are the Reds to the point that they don't miss on first round picks, but they have also demonstrated the ability to find potential impact talent in the third and later rounds. The organization's ability to find talent is a large part of the reason why they are enjoying consistent, sustainable success at the MLB. Langfield's combination of solid stuff and solid mechanics are enough to land him at #11 on the list. However, it's so early in his career that he has a long development road ahead of him. I'll need to see more refinement in mechanics and repertoire before he'll move up the list, as he currently seems more "solid-average" than "impact-elite". However, the upside is evident and he has a chance to develop into a valuable prospect. Sports Illustrated writer Tom Verducci just wrote an article that attempts to call into question the value of the disciplined hitting approach and attempts to indict its premier practitioner, Joey Votto. Verducci is most well-known for "The Verducci Effect", which is a pitcher workload rule of thumb that has been frequently discounted and disproved by sabermetricians. Jayson Werth of the Washington Nationals swings at a 3-and-0 pitch and when he grounds into a double play he invites howls of scorn about how could he have done such a dumb thing. Joey Votto of the Cincinnati Reds is hailed as an on-base machine because he takes more walks than anybody, though he has yet to get an extra-base hit with a runner on base and he lets more strikes go by with each passing year. Welcome to the state of the art in hitting these days, where aggressiveness is disdained and passivity is exalted. The modern hitter is guided by the accepted wisdom in catchphrases such as "driving up pitch counts," "taking pitches" and "quality at-bats." There is one serious flaw in this groupthink strategy. Hitters are striking out more than ever before in baseball history while runs, walks, hits and home runs have been on the decline for years. And while teams still preach the religion of driving up pitch counts to "get into the bullpen" of the other team, they may be pushing an outdated agenda. So fortified are major league bullpens these days, especially with hard throwers, that last year relievers posted an ERA more than half a run lower than starters and averaged almost one strikeout for every inning. The proliferation of measurables in baseball is helping a generation of hitters turn offense into a passive aggressive pursuit. While batting average rightly has lost much of its inflated value, the flip side is that ubiquitous pitch counts, pitches per plate appearance, walks and on-base percentage are influencing how hitters go about their jobs. As Yankees outfielder Vernon Wells told me in spring training, "Everything is measured these days, and players know it. There's so much attention on pitch counts and how many pitches you see. Players are aware of it. When you get deeper counts, you're going to get more strikeouts." Cubs president Theo Epstein said it best when he observed, "In the information age, things that are precisely measured are rewarded disproportionally relative to impact." What we are left with is a sport in which games keep getting longer but with less and less action. The ball is not put in play on 81 percent of the pitches, an all-time record of inactivity. The knottiest issue for baseball is not the stadium issues of Oakland and Tampa Bay or the Biogenesis scandal; it's the increased lack of action in your average baseball game. Mindsets need to change. Think about Werth's decision to swing 3-and-0 Sunday. The guy is a veteran hitter with a good idea of the strike zone who is playing under a $126 million contract. And yet when he grounded into a double play you would have thought he committed the dumbest act on a baseball field since Jose Canseco headed a fly ball over the wall. Why? Nobody swings 3-and-0 any more. You're supposed to take the pitch to drive up the pitch count and lengthen your at-bat, nevermind that it might be the best pitch the hitter sees. Last year major league hitters managed only 94 hits on 3-and-0 counts, or about one hit on a 3-0 pitch every 26 games. (They hit .348 when they did put 3-0 pitches into play). The 94 hits on 3-0 were down 24 percent in just a decade, down from 123 hits in 2002. So because hitters swing less often on 3-and-0, Werth gets criticized for doing something "wrong," even though the average big leaguer slugs .767 when he does put such pitches into play. It's not just 3-and-0 pitches. Hitters are turning traditional hitters' counts into passive counts. The number of plate appearances decided on 2-and-0 counts has gone down six straight years. Home runs on 2-and-0 counts dropped 33 percent from 2000 to 2012 (from 384 to 259). Do the math: hitters are swinging at the first pitch less and less and striking out more and more. You hear so much talk about "grinding out at-bats" and "making the pitcher throw more pitches" that you would think seeing a lot of pitches is a denominator to success. You would be wrong. There is no correlation between seeing more pitches and winning more games. Entering this week, only one of the six first-place teams ranked among the top 11 teams in pitches per plate appearance. Five of those 11 teams that saw the most pitches had losing records. Last year there were 13 teams that ranked above average in most pitches per plate appearance. Nine of those 13 teams did not make the postseason. The two pennant winners, San Francisco and Detroit, ranked 25th and 27th in pitches per plate appearance. If there is one hitter who best personifies the modern passive aggressive approach it is Votto. He has phenomenal patience, balance and hand-eye coordination. Last year he came to the plate 475 times and suffered the embarrassment of the one-pitch out only 19 times. This year Votto is off to a wildly efficient start. In 20 games he has reached base 49 times, including 25 times by way of a walk. His on-base percentage is a robust .500. According to the favored modern measurables, he is an offensive dynamo of historic proportions. But that's not the whole story. Votto, who won the 2010 NL MVP Award when he hit 37 home runs, has become an extreme version of himself. He is swinging the bat less often with each passing year. No one should advocate Votto start chasing more pitches out of the strike zone, but it's interesting to see how Votto is letting more and more good pitches go by without attempting to swing. His percentage of swings at strikes has gone down four straight years: 74, 73, 69, 62, 60. Votto has told me the more pitches he sees, the more he believes the at-bat swings in his favor. Now consider what Votto has done this year with runners on base. The Reds' number three hitter has come to the plate 51 times with runners on and produced zero extra-base hits. His slugging percentage with runners on is .188. Only twice this year has he driven in a teammate with a hit. But he has an awesome on-base percentage. Walks are great because they are one indication of "winning" the batter-pitcher matchup and lead to runs. But walks, other than calculating on-base percentage, are not exactly as good as a hit. They put no pressure on a defense and advance runners only one base at a time, and even then only when a force is in play. Votto is a master at winning confrontations against pitchers with his discipline and patience. He is rewarded in the modern groupthink for a lack of activity -- for not swinging the bat. Offense becomes defense. He is the supreme state of the art hitter. The problem is the state of the art isn't working. Few hitters are as good as Votto. More teams than ever deploy two batting coaches, not one. More ballparks have constructed multiple batting tunnels that almost never go empty from four hours prior to the game to the last out. Video is more abundant and portable than ever. More data is available. And yet the modern approach to hitting is failing. Pitchers are four years into a run of dominance and there are no signs that their run is abating, especially when the modern passive aggressive approach to hitting has become so ingrained. For me, the most interesting part of the Verducci article is the notion that getting into the bullpen early isn't the advantage it used to be. Frankly, I think that's his most valid point, as there are so many big time arms in the modern bullpen. Outside of that and the Theo quote, the article is rather questionable. 1. Verducci states that "the one-pitch out has acquired the worst reputation in the culture of hitting." Is that true? I'm a big advocate of grinding ABs and a patient approach, but I don't get up in arms over a first pitch out unless it falls within select scenarios. For example, if the pitcher has walked the previous hitter or two and is not demonstrating any control. Or, if you have a speed merchant on first and you want to give him a chance to steal a base. And, a few other instances. Still, on the whole, if you get a good pitch to hit on the first pitch and put a good swing on it, I don't have a problem with it. I tend to think most agree. 2. Verducci gets slippery here, saying "There is no correlation between seeing more pitches and winning more games." That's true, but misleadingly so. There is a correlation between seeing more pitches and drawing more walks. There is a correlation between drawing walks and On-Base Percentage. And, there's a strong correlation between On-Base Percentage and Runs Scored. Of course, wins are frequently driven by Run Differential. And, Runs Scored are only part of the Run Differential Equation. So, a team that's great at getting on-base and scoring runs may be poor in Run Prevention, which would drag down the Run Differential and, consequently, wins. 3. Following up on point 2, Verducci again gets slippery in saying "The two pennant winners, San Francisco and Detroit, ranked 25th and 27th in pitches per plate appearance." Of course, this point is misleading in that it leaves out the massive success those two teams have in Run Prevention. It matters less if you scuffle in Run Production when you have Justin Verlander, Matt Cain, and company holding down the Run Prevention. 4. Again, Verducci gets slippery in saying "Hitters are striking out more than ever before in baseball history while runs, walks, hits, and home runs have been on the decline for years." He fails to demonstrate that patient hitting approaches are creating the decline in offense. He doesn't establish causation. In fact, the more likely explanation is MLB's efforts to rein in IPED usage. If Barry Bonds type hitters aren't around to swat 73 homeruns and be pitched around by every pitcher on the planet, then offense and walks will decline. I would agree that patience is partially responsible for the increase in strikeouts, as you can't strikeout unless you are patient enough to see more than 2 pitches. Juan Pierre never walks or strikes out because he swings early and often and makes good contact. Still, you have to see 3 pitches to strike out and 4 pitches to walk. 5. In the end, Verducci fails to properly support his premise that patient hitting approaches aren't working, settling instead for a mixture of logical fallacies in the guise of analysis. Sometimes a picture is worth a thousand words. That rings especially true when talking about the mechanics of baseball, as a visual frequently drives home a point more effectively than eight paragraphs of labored description. So, I'll keep this short and sweet. The below Cingrani photo more effectively illustrates one of the key tenets of kinetic-chain pitching mechanics than I ever could. I've written at length about kinetic-chain pitching mechanics and the benefits they can have on both performance and injury prevention. Part of the reason why I'm so high on Tony Cingrani is his mechanics. Since he's the flavor of the month, it's worth highlighting part of what makes him so effective. One of the key concepts of kinetic-chain based pitching mechanics is the differential between the rotation of the hips and the rotation of the shoulders. The greater that differential, the greater the ability to generate the force that powers the pitch with the body, instead of the arm. There is a clear and very substantial differential between the rotation of his hips and the rotation of his shoulders. In this photo, if you were to draw a line through the hips, it would run basically from 1st base to 3rd base. If you were to draw a line through the shoulders, it would run basically from 2nd base to home plate. Basically, his hips are square to homeplate, while his shoulders are square to first base. The earlier rotation of the hips creates significant tension in the spine. That tension creates energy that moves from the hips to the shoulders to the pitching arm as the spine uncoils. Cingrani's delayed shoulder rotation basically results in the pitching arm being pulled around by the energy of the body, rather than having to rely on the arm itself to generate that energy. Cingrani's effective use of kinetic-chain mechanics is part of what makes his fastball so effective. And, it should have the added benefit of reducing the risk of arm injury. Just about every scouting list has Billy Hamilton and Robert Stephenson rated 1 and 2 in the Reds system. I went with Hamilton and Tony Cingrani. Here's why. For me, Stephenson slots in behind Tony Cingrani because Stephenson's advantage in upside over Cingrani is smaller than Cingrani's advantage in probability over Stephenson. Cingrani's performance level was so high in 2012 that even if everything breaks right in Stephenson's development he'll likely only be able to match what Cingrani did in 2012. And, it'll take Stephenson 1-2 years to even reach triple-A. Stephenson has a slight advantage in stuff, but unlike Cingrani he also has to manage 1-2 years of performance and injury risk. Ultimately, Cingrani's advantage in polish, probability, and pitching mechanics outweighs Stephenson small advantage in stuff. Cingrani is an interesting one. I like him a lot. More than any of the scouting reports I've read and I've read a number of them. So, either I'm overly optimistic or the pundits are overly pessimistic. Granted, it's probably the former, but I can't help but feel that the scouting reports are all parroting the same talking points. And, somehow, it all feels much more like group-think than independently formed opinions constituting a consensus. Maybe it's just because I disagree with many of the points, but I wonder if the internet, by speeding up the flow of information, is resulting in more overlap in opinion. Or, maybe the pundits are just correct. It can't really be argued that Cingrani has a higher probability than Stephenson, so pundits are focused on Cingrani's performance level. Citing potential issues that would prevent that performance level from carrying over to the majors. Cingrani leans too heavily on his fastball. Cingrani's fastball is effective because of deceptive arm action, which won't "fool" MLB hitters for long. Cingrani needs to refine his breaking ball. As to the first, while the reports point out his heavy fastball usage, most downplay his plus change-up, which is an effective pitch for him. So, he has two plus-pitches, not just one. As to the second, the arm action is one of the things I really like about him. He has nice kinetic-chain pitching mechanics and the resulting delayed shoulder rotation really gives his arm a strong whip-like action. In addition, while he doesn't look big, he actually stands 6-4. The height, and resulting longer arms, means that he (1) releases the ball closer to the plate and, (2) because of his mechanics, gets more whip out of his longer arm. I'm just not at all convinced that the success of the fastball is based on "deception", nor am I convinced that it's a pitch that will be easily "figured out" by MLB hitters. And, as to the third, while I certainly agree that Cingrani needs to refine his slider, the whip-like arm action should ultimately work well with a slider. In addition, Cingrani's change-up has a tailing action, which makes it an effective weapon against opposite-side hitters, so it's not like he profiles out as a lefty-specialist who can't be successful against righties. Ultimately, I'm excited to see what Cingrani can do. Maybe the pundits are right, but I'm really optimistic about his future. His MLB career gets underway in earnest tonight against the Marlins. Time will tell. Earlier this offseason, I spent some time studying the hitting process. Searching for better understanding. I wanted to find common elements in the swings of good hitters. After that, I looked at a few hitters who were struggling to live up to sterling reputations to try to identify the reasons. The first hitter I looked at was Dustin Ackley and I wrote about the flaw that was creating his problems. The second hitter I looked at, but didn't write about, was Gordon Beckham. I saw a few things that were potentially problematic, but just filed them away for future reference without giving them another thought. Until today. When watching video of Tanner Rahier, his swing seemed oddly familiar. It took me a minute to place it, but the "familiar" was Gordon Beckham. It's probably not ideal when a prospect reminds you of a player that you only researched to figure out why he was under-performing, but let's take a closer look at Rahier. The Reds selected Rahier with the 78th overall pick in the 2nd round of the 2012 draft and signed him away from a commitment to the University of San Diego. Rahier opted not to play baseball for his high school during his senior season, electing instead to play for a travel team in a wood bat league. In fact, he didn't play for his high school after his freshman year, as he felt Division 4 baseball didn't provide sufficient competition. Rahier was the type of amateur player who had early-on set his sights on professional baseball. He spent extensive time on the travel team circuit and developed a workout regimen with the help of his father, a "professional sports performance specialist". His workout included hauling weighted tractor tires across fields and swinging oversized axes at hardened trees. The workout has given him a chiseled physique. He was focused on the goal of becoming a professional baseball player and willing to work to make it happen. Part of the appeal with drafting Rahier was his experience with wood bats and his relative polish for a high school prospect. He played roughly 60 games a season, instead of 25-30 that were played in high school. Unfortunately, none of that was apparent in his professional debut, as he struggled far more than was to be expected. The Reds sent Rahier to the Rookie Arizona League. He signed early enough to log 193 ABs in 51 games during which he hit .192/.266/.311/.577 with 4 homers and a 43/21 K/BB ratio. Typically, I don't put much weight in a prospect's performance in the couple of months after he signs his first contract. They have already put in a full season of amateur baseball and could be tired. They are adjusting to professional baseball. Some haven't even previously lived away from home. So, there are a lot of mitigating factors. In essence, Rahier gets a mulligan on his 2012 season, but there are a few mechanical issues that could confirm the validity of his struggles. There are things I like about Rahier's swing and things I don't. It's the latter that reminds me of Gordon Beckham. His swing reminds me of Beckham in the following respects: 1) grip on the bat, 2) hitch during loading of hands, and 3) raising the back elbow above the line of the shoulders. 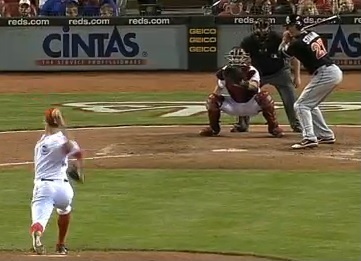 On the other hand, I like Rahier's (A) pre-pitch stance and (B) hitting position at the point of impact. The potential problem exists in getting from A to B in a timely manner. If the path to B is too circuitous then it won't matter if he's in a strong hitting position. His swing needs to get him into proper hitting position in time to make consistent, hard contact or else he won't ever reach his hit tool. So, the question for me on Tanner Rahier is whether there is too much superfluous movement in his swing mechanics between pre-pitch and point of impact to allow him to be an effective hitter. Rahier starts with a slightly wider than shoulder-width stance. He holds his back elbow high, forming a line parallel to the level of his shoulders. Like Beckham, Rahier utilizes a very strong grip on the bat. He doesn't line up the "knocking knuckles", as is traditionally taught (similar to Ken Griffey Jr.'s hand position in photo below), but rather rotates the hands into a position more in line with the Barry Bonds photo below. Obviously, when you are talking about Griffey Jr. and Bonds, you are talking about two of the best hitters in baseball history. So, the grip on the bat can obviously vary in the pre-pitch stance, but by the time the swing reaches the point of impact, most grips are going to resemble the lined up knocking-knuckles grip. So, as long as your hands get into that position at the point of impact, it is less important how they start. However, the grip can impact the loading of the hands and, when paired with other components of the swing, it can create additional length in getting to the point of impact. Just for fun, as you are sitting at your computer reading this, grip an imaginary bat with your knocking-knuckles lined up. Then rotate your hands into the stronger grip position, a la Barry Bonds. In making that small change, you can actually feel your elbows rotate outwards and your shoulders become more prevalent in the stance. The stronger grip seemingly makes the trigger of the swing more dependent on the shoulders and upper arms and less dependent on the hands and wrists. In short, the shifting of the grip emphasizes the larger muscles in the pre-point of impact portion of the swing. 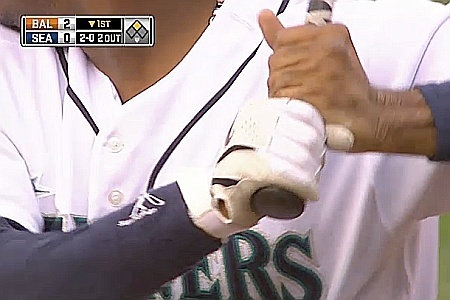 Obviously, there are hitters who have no problem using this grip to great effect. However, when paired with two other components, it has the potential to be problematic. Those two components are a hitch in the swing during the loading of the hands and an elevated back elbow. Rahier has a hitch in his swing. As he draws back his leg in his stride, he drops his hands when generating load. Again, some hitters can make this work with no problem. Eric Davis had a big hitch, but his hands were so quick that it made little difference. However, after the hitch drops his hands, Rahier brings the bat back up by raising his right elbow up above shoulder level, which tilts the barrel of bat forward towards pitcher (see photo below). The upper body tilt almost gives his front side the shape of the letter "C". It's this position (photo below), that Rahier shares with Gordon Beckham. And, it's this position that creates additional length in getting from pre-pitch stance to point of contact. In short, the hitch adds length to the swing path. So does raising the back elbow up above shoulder level coming out of the hitch. So does tilting the bat forward towards the pitcher. And, the stronger grip may hinder his ability to overcome the added length in order to get to the point of impact in a timely manner. All of these components just make it difficult for Rahier to get the bat head into the zone early enough. Individually, these components can be made to work. Barry Bonds (and many others) effectively used a stronger grip prior to the point of impact. Eric Davis had great success despite a massive hitch in loading his hands. Gary Sheffield frequently titled his bat forward towards the pitcher (though I don't think his back elbow ever came up past the level of the shoulders). But, can a swing that combines all three components (strong grip, hitch, and elevated back elbow/bat tilt) be effective against advanced competition? Rahier will get every chance to prove that it can. In addition to these upper body movements, his lower body movements warrant discussion. When the pitcher drives to the plate, Rahier draws his front knee back towards his back leg before striding past his initial foot position to meet the pitch. Rahier's stride creates potential problems with body movement and inconsistent eye level. When he draws his front knee back, his back knee flexes and his head drops. He goes from an upright pre-pitch stance to a one-legged crouch when he draws his stride foot back, which results in his eye level dropping. In the following four photos, focus on his head. The head position is similar at the start (photo 1) and at the finish (photo 4), but it moves a lot in between. You can see how his head moves back and down (photo 1 to photo 2), then rises up as his stride drives forward (photo 2 to photo 3), and finally drops back down when he gets his stride foot down (photo 4). The first photo shows his pre-pitch head position. The second photo is shows the head position at the apex of his leg kick, before he drives forward. The third photo shows his head position at its highest point, when he strides forward. The final photo shows the head position when he fires the swing. One of the reasons I like the above photos is that the dugout behind him actually provides good points of reference. The roof of the dugout gives a reference point for vertical movement and there is actually a post in the dugout that provides a good reference point for lateral movement. If you look at his head in the first photo, the post in the dugout basically runs down through the very back of his helmet. If you look at his head in the second photo, the dugout post actually runs down at the front edge of the bill of his helmet and his lead shoulder. That's a significant amount of head movement. As for vertical movement, the line of the dugout roof provides a good point of reference. If you compare how low the head is in the second photo with how high it is in the third photo, then you get a feel for how much vertical head movement is contained in his swing. The obvious problem with a lot of head movement is that it changes the eye level, which can make it more difficult to effectively track pitches. In short, the lower body action gives Rahier's swing a significant amount of both backward-forward and down-up movement. While the majority of the above focuses on potential red flags, there are certainly things to like about Rahier's swing. He can get into very good hitting position (as evidenced by the photo below), including a firm front side (anchoring the swing and allowing his momentum to rotate around his front leg), good hip rotation driving him up on the toe of his back foot, and maintaining arms in good hitting position, keeping his back elbow in close to the body. In addition, he isn't reaching for the pitch, instead letting it travel deep in the zone, maximizing the power he transfers to the ball and giving himself more time to recognize the pitch. This position should enable him to generate maximum rotational force to power the swing, which when coupled with strong wrists and forearms should allow him to produce solid/average power in the future. This is a strong hitting position and that shouldn't be discounted. However, the question with Rahier is whether everything that comes BEFORE he reaches this hitting position will drag down his performance at the plate. There is so much movement in his leg kick and in the loading of his hands that he may struggle to get into proper hitting position in time to connect with the pitch. It doesn't matter if you can get into proper hitting position if it takes you too long to get there. It doesn't matter if you can get into proper hitting position if there is too much superfluous movement to allow you to properly track the pitch. In the end, there are some mechanical issues that Rahier is likely going to need to address. At the same time, they aren't flaws until they affect his performance. And, even if they prove to be flaws, they aren't of the uncorrectable variety. Hitters can and do change their swing mechanics and/or approach as they develop in the minors. Some for the better (Joey Votto). Some for the worse (Ryan LaMarre). It's way too soon to know which path Rahier will travel. The general consensus is that Rahier will likely end up at third base and I tend to agree, but the Reds are likely to give him the chance to play his way off the position. "We were a little surprised," said Chris Buckley, the Reds' senior director of amateur scouting. "I think it's probably because he's going to have to move off of shortstop. He's a little too big for the position. That's our guess. But he was a very high profile guy. We were happy he was there. We'll give him a chance to play shortstop, but he might be too big to stay there." Some scouting reports list Rahier's fielding actions as rough, but they look solid and fluid to me. And, his arm strength isn't in question, as he touched 93 mph on the mound as an amateur. So, as mentioned by Chris Buckley, the question is whether he has enough range. He's physically big for the position, but the larger issue is that he just doesn't run well, lacking both speed and quickness,which is difficult to improve. When all is said and done, Rahier lands at #16 on the list. On the plus side of the ledger fall his arm strength, make-up, work ethic, solid fielding actions, and solid power potential. On the negative side of the ledger are his questionable swing mechanics and his likely inability to stick at shortstop. He may ultimately prove to be a tweener, not enough offense for third base, but not enough defense for shortstop. It's very early in his career and any flaws have yet to really bubble to the surface, but he's clearly willing to put in the work necessary to improve. His career gets underway in 2013.